We here at Sega-16 love Beggar Prince. We’ve previewed it, reviewed it, interviewed Super Fighter Team president Brandon Cobb, and even weighed its impact on future Genesis releases. Yep, suffice it to say that we love the game, and we’ve been eagerly awaiting any new information on the hit product from Super Fighter Team. Cobb and company have always been happy to share the love with us, and we’re proud to have been a part of this historic release. Yes, from its early announcement to our evaluation of the final product, Sega-16 has been at the forefront of everything Beggar Prince, bringing you all the information you’ve needed to get on board with this wonderful title. When it was first announced last year, the 32Mbit Beggar Prince sent waves through the retro gaming community. 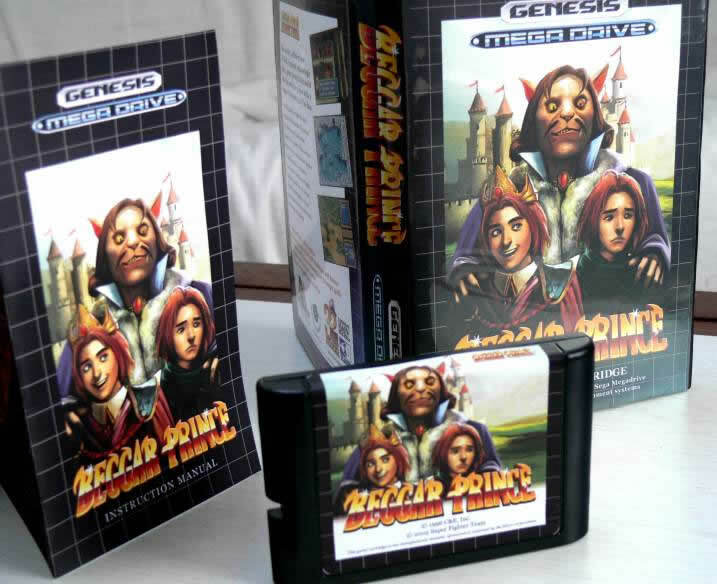 It was the first new Genesis product released since Majesco’s Frogger quietly arrived on store shelves in 1998, and gamers everywhere were excited at the prospect of owning the game in actual cartridge form, complete with box and manual. Though Beggar Prince originally appeared in Taiwan in 1996, the rest of the world had never seen it, so it was seen as “new” for everyone in the West. The initial batch of six hundred carts was snapped up quickly, so when Super Fighter Team offered a second wave of three hundred cartridges a few months ago, many believed that it marked their last opportunity to own a copy. Well, we’ve got a scoop for you, one that’s bound to please anyone who missed out on the first two runs of this hit game. We recently spoke to Super Fighter Team president Brandon Cobb, and he’s given us the exclusive first look at the third – and final- run of the action/RPG that’s taken the Genesis world by storm. There’s been some major changes to Beggar Prince, and Cobb’s group has taken the concerns and requests of the gaming community to heart in order to provide the best possible product. What’s new to this version, exactly? Read on, dear friend and find out! First off, the box art that caused so much controversy has been replaced. The new artwork is much better, in my opinion, and it really does a great job of conveying that classic American Genesis cover look we all remember. That’s not to say it’s tacky or anything, but rather that it’s decidedly un-Japanese in style. The new look also adorns the full color instruction manual and cartridge label, so those who were apprehensive about buying a copy due to something as trivial as box art no longer have an excuse! Beggar Prince had very special programming for its save function that was done differently than ever before in a Sega Genesis/Mega Drive game. Why? I’m not exactly sure. I believe it was done on purpose; however, perhaps due to the nature of how the rest of the game was programmed. If you are a programmer, this would make more sense to you – if you aren’t, well, it can just be plain confusing. In any case, C&E programmed the save feature the way they did for a reason, and didn’t realize their save feature wouldn’t work on a 32X or Sega CD because, well, no one in Taiwan owned these units or had really even heard of them. Super Fighter Team tried to fix the problem before launch (over a year was spent on bug testing overall), but time and cost constraints forced it to concentrate on only those bugs that could potentially crash the game. Beggar Prince’s original publisher in Taiwan, C&E Inc., only granted permission for publication and provided very little technical data about the actual game itself. For that reason Cobb and his crew had to fix as much as they could internally, and the final product was actually a stronger and more solid build than its Chinese sibling. Now, thanks to more time and funds, this problem has finally been remedied. This latest batch will run, with full save and load capabilities, on any stock Genesis console. Furthermore, it will now save and load perfectly on a Genesis 32X, Sega CD, Sega CDX, JVC X’Eye, and Pioneer Laseractive. Finally, you can run the game without problems, no matter what set up you have. I’m sure that by now you’re wondering just how much all these added goodies are going to run up the price. Luckily, I have some more good news for you! The third run of Beggar Prince will cost exactly the same forty ($40) dollars as the first two. Even the increase in post office fees will not affect the price. How about that? Really, you have to give it up to Super Fighter Team. To actually go back and rework the only two areas that got any negative feedback, and then offer a new version of the game for the same price? That’s dedication. Due to enormous demand, the first two runs of the game (nine hundred copies in all) sold out very quickly, and this last batch is sure to go just as fast, if not faster. There’s no reason for not owning a copy, as all the major issues with previous versions have been corrected. Don’t miss out on your final chance to be a part of Genesis history with the best version of Beggar Prince yet. Super Fighter Team will debut the third run at the Retrogaming Connexion in France later this month, and we’ll be sure to update with the latest info. You can also watch the game’s official thread in our forums for all the latest details on the game straight from Super Fighter Team itself. In the meantime, head on over to the official Beggar Prince website and reserve your copy while you can!